A vegetable stir-fry is one of the quickest basic meals you'll want to incorporate into your cooking repertoire when you go vegetarian or vegan. As a vegetarian, you'll want to stock your pantry with a few ingredients so that you can whip up an easy vegetable stir-fry any time for a quick meal. Keep some garlic, onions and ginger on hand, add just about any kind of fresh vegetables, and your vegetable stir-fry is almost complete! Here's a few inspiring vegetarian vegetable stir-fries to get you cooking. 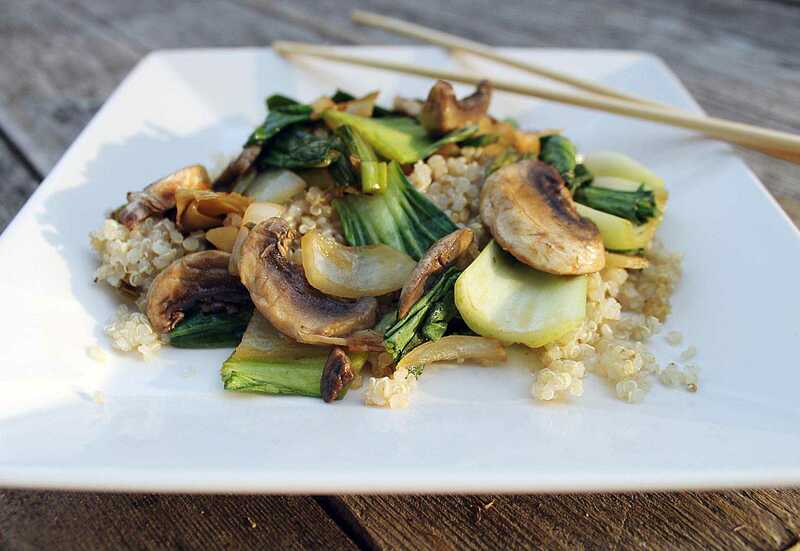 Bok choy and shiitake mushroom stir-fry over quinoa. Combine bok choy and shiitake mushrooms stir-fried in a garlic sesame sauce for a healthy vegetarian vegetable stir-fry recipe. I tossed it with some leftover cooked quinoa and thoroughy enjoyed it. A classic vegetable stir-fry recipe piled high with healthy veggies - snow peas, cauliflower, broccoli and carrots and quickly cooked with tofu in a simple soy sauce-based sauce with ginger. It's not a fancy recipe, but if you're new to vegetarian cooking, or just want something simple, this is a good recipe to start with. Not convinced? Check out the numerous positive reviews from readers that love this recipe. Swiss chard, mushroom and tofu stir-fry. There's something about the heartier texture of Swiss chard, when compared to other greens, that always makes me want to top it off with a bit of grated cheese. I ate this stir-fry plain, rather than pairing it with rice or whole grains, but I think next time I'd like to try it with homemade noodles and yes, topped off with cheese. Seitan stir-fry with Chinese hoisin sauce. Sheridan S.
is an excellent addition to any vegetarian stir-fry, but it can take a bit longer than tofu to cook thoroughly so that it's not too chewy. As with most stir-fry recipes, you can sub out the vegetables for any that you happen to have on hand. Because this recipe has plenty of sauce, it's a good one for pairing with noodles. Like most vegetable stir-fries, this one would go great with rice noodles, brown rice or any grain you like, but it's also delicious on it's own. Tempeh is cooked with colorful bell peppers in a sweetened teriyaki sauce with garlic, ginger and a bit of rice vinegar. Don't have all the ingredients on hand? Try using just a teriyaki sauce by itself. Like most vegetable stir-fries, this one is also vegetarian and vegan. Thai bell pepper stir-fry in hoisin sauce with tofu. From the streets of Bangkok to the southern islands, travelers to Thailand always revel in the amazing food to be found everywhere. Vegetable stir-fries such as this one are usually accompanied by rice or occasionally noodles and are often topped off with extra chilies or hot sauce. Thai food is great for vegetarians and vegans, and this simple and easy version of stir-fried veggies is an enjoyable basic meatless meal. This recipe calls for tofu and plenty of vegetables, including green beans, broccoli and bell pepper stir-fried with a bit of like, garlic and lemongrass for a subtle Thai flavor. Isn't it beautiful? This Chinese-inspired recipe uses stir-fried vegetables - including mushrooms, red bell peppers and broccoli - and mock meat to top off chow mein noodles cooked in a Chinese black bean garlic sauce. Adding noodles to this vegetable stir-fry recipe makes it a complete vegetarian and vegan meal. Want to try some vegetable stir-fries on your own without a recipe, or just want to see how it all comes together? Follow this quick step-by-step instructional to see how to make a simple vegetarian stir-fry, no matter what ingredients you're using. Did you know, for example, that you can toss quick-cooking noodles right into the pan?